Thank you! You have a wonderful spread here. It really does make a difference to circle lock and be patient. The only one it doesn’t seem to work on is Lugia and Moltres, because of how they attack. I forgot trades can count towards this, but I’ve traded for a Legendary only once, and that was a Shiny Moltres. A real mixed bag of good, ok and poor in that lot. I don’t use the set circle method. Tried to get the hang of it but abandoned the practice session and just got on with the game. These are all anticipation Curve Ball throws. I do get greedy and go Pinap a bit when the CP is poor possibly hurting the catch rate a little. Don’t feel bad about it. We all have our playing styles, and often pressures and other things can affect them. When the CP is bad for a Legendary, I often use regular Razz Berries to go for them, and I’ve found there’s still a 1 in 12 chance or so to catch them using them, so it’s not that bad, but it’s not great. 1 in 10 using Silver Pinaps, but those are harder to come by. For me personally I won’t bother myself with catch rates unless I actually make an honest attempt to catch using all the tools at my disposal. Generally I raid with a group that does multiple raids in rapid succession. I find that at some point I am only farming candy and don’t make an effort unless the IVs are spectacular. Oh, I get it. I still attempt to catch a Pokemon but if the CP is trash, I will use regular Razz Berries instead. It’s about a 1 in 12 chance to catch with them, but I still seem to hold a 75% catch rate with those I’ve used Razz Berries on. I usually still try so I can get the candies should I need to level up a great one. You Raiding and running from trash IV’s @Thorend in order to get to the next one hoping the next is the great one or is it to cram as many Raids into 1 Lucky Egg? We have groups that do that from time to time but I don’t join in with that. I like to have a go for the Candy but may not take anywhere near the time and care that I do for a keeper. It’s in line with why I don’t Shiny check as I hate to walk away from the Dust. I have to try to catch them all. I dont personally just run, but I won’t necessarily set the circle and wait for the perfect time to throw either. I also won’t waste golden razz on a bad IV Legendary just because it is legendary. That’s why I don’t track the catch rate because maximum effort isn’t given in every catch attempts. We share a similar philosophy in regular catches although I make exceptions if I’m stocking pokeballs for my gotcha or just prior to the start of community day. Updating mine now that I’m done with Latias and Palkia. Decided to put together a proper spreadsheet for it instead. Nice idea, @Arem1771, but not accurately answerable for players who haven’t been keeping their own stats by hand along the way. As @Jormdeworm pointed out with the Celebi example, not every “seen” count in the dex is a chance to catch (for one thing, seeing a pokemon in a gym registers one in the “seen” counter, whether you battle it or just look at it). 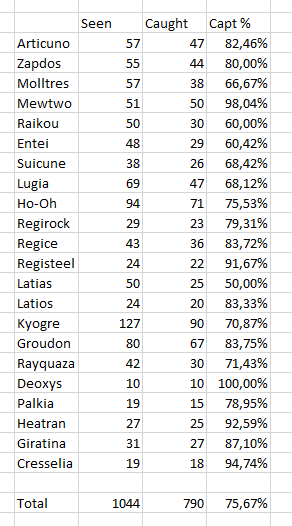 Even though that doesn’t affect legendaries (since they can’t be left in gyms at all), the duality of raid bosses vs. research task rewards skews counts (does a task reward pokemon EVER flee? they’re a guaranteed catch eventually if you hit it with a throw) For example, since I never raided a Suicune, Entei, or Raikou during their time as raid bosses, my capture rate for all three is 100%. 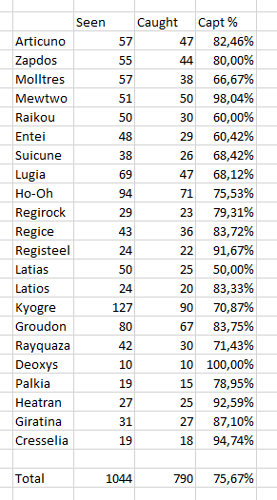 @vorgriff3 That’s a fair point, but since the majority of the depicted catches were in Raid Battles, the impact of taking out the Field Research Encounters minimally affects the overall ratio, really. Truthfully, aside from the Birds and Beasts, I only caught two or three of Lugia or Ho-Oh, and only one Regice and one Regirock outside of Raid Battles. The birds are trickier to track, as they were out a total of three times, but I can make a slightly rough guess based on how many videos I have of them, in addition to my memory of what the stats were before the special event days last summer–and I pride myself in having an excellent memory, especially with math. 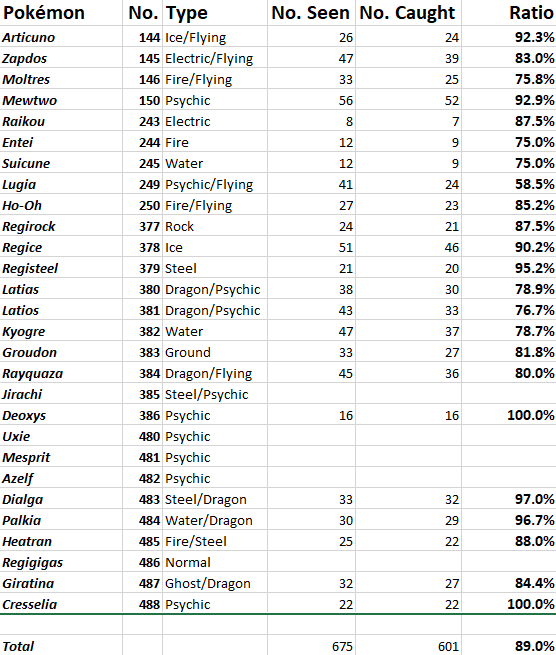 Based on that, here are their stats. As you see, it didn’t even affect it a full percentage point. While this difference might not hold true for anyone else on here, it holds true for my statistics keeping. Overall, since the difference is so miniscule in overall ratio, I often overlook it. I traded for a Legendary only once as well, and that was taken into consideration and removed. For everyone else, I really don’t care how you present your stats, as long as it’s accurate to your Pokedex and your considerations about it. If anything, this is a great place to brag about how many of a certain Legendary you’ve caught. Yeah trades and research kinda affects these numbers, but since its the best option i would just take those for granted. 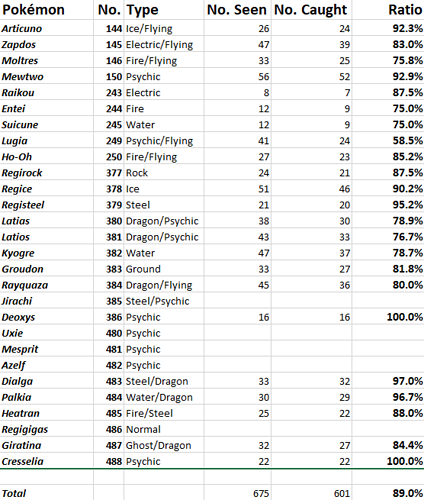 I’ve raided only about 20% the number of legendaries as you and have no realistic expectation of ever catching up. I’ll try to applaud your milestones without getting too envious as I trail far behind the pack here. Hey, it’s fine. My husband is a software engineer who specializes in analytics. He’s in a similar boat with his catch rates as well, and has caught far less Legendaries, and most of the ones he got the first entry on came from trading with me. Unless you have a hand written Dairy of all Raids done like I do (warning Nerd alaret) it can only be based on Seen Caught so anyone can play show and tell. P.S. I don’t have every single Raid recorded in a Dairy but it would be 80-90% of them as I started doing that when I became a part of a local research group for working out how to trigger Ex Raids and playing all the family accts at once myself. Or if they’re like me and have a photographic memory when it comes to numbers and statistics.